Using emulator as a monitor to my phone? The screen of my Google Pixel burned out the other day. The phone still works, but the screen doesn't turn on. Is it possible to connect to my phone via adb and use an emulator to see what the phone is doing (essentially, use an emulator as an external monitor)? I can connect to the phone via adb and use shell, but what I need to do is access my Google Authenticator to get two factor authentication codes. Add Vysor as an app on Chrome. Connect mobile device with USB debugging on. Allow debugging on the popup that comes on the phone. Vysor should then start showing the phone screen. Vysor lets the user project the screen and also control the phone from the PC. 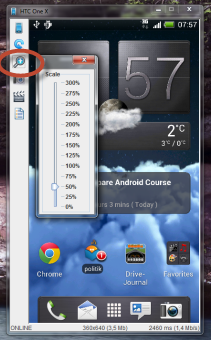 Droid@Screen is a tool that will show the screen of your phone, once all previous steps have been completed (i.e. drivers installed, usb debugging enabled, etc). Set adb in PATH variables or just navigate to the platform-tools dir to start it. Whenever you want to project the device, start Droid@Screen and plug in your device. Droid@Screen will automatically start showing the screen. Your computer screen can then be projected on a bigger screen using a projector. Not the answer you're looking for? Browse other questions tagged adb broken-screen external-display or ask your own question. I have broken screen. Can I root my phone only with downloading mode and recovering mode? Are these adb commands safe? Can I use a 32:9 aspect ratio monitor on an android TV PC? Can a phone act as computer replacement?